The AR.Drone 2.0 has two high-definition cameras that stream and record video on your control device. Just when you thought the Parrot AR.Drone was awesome, it gets awesomer. 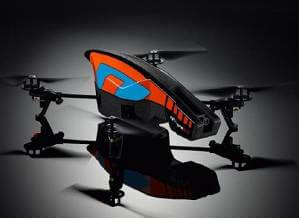 Parrot gave quadricopter enthusiasts a sneak peek at its new AR.Drone 2.0 at CES Las Vegas. Sporting new HD cameras it can stream and record a 720p video in front or below at 30fps. The 1280×720 camera also has a 92-degree, wide-angle lens. Instrument upgrades such as a pressure sensor for better altitude control and new electronic assistance for better navigational control makes for more stable flying. As was the original, the AR.Drone 2.0 is still controlled via WiFi with an iPad, iPhone, or any tablet or smartphone with Android. The new HiDef video is fed realtime to the device screen, and recorded so you and your friends can relive the hairy moments. Better sensors allow the drone to fly higher than the original, and a new augmented reality feature recognizes shapes in its flight path and paints AR elements onto them. Talk about a real world video game. Find the Parrot’s press release here. At $299 MSRP, the AR.Drone 2.0 is the real drone we can afford. I didn’t get their first quadricopter, but apparently it wasn’t the easiest flyer to control. But it sounds as though the improved stability of the 2.0 makes it possible to just launch and go. When it comes out the second quarter this year, I just might.